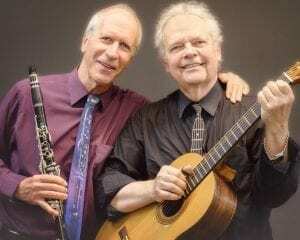 “Elegant.” “Riveting.” “Soulful.” “Classic mastery.” These are a few of the terms that have been used to describe the unique and stunning swing-jazz music of acoustic guitarist Guy Van Duser and clarinetist Billy Novick. This Saturday they will be will be performing at the Luckart Gallery next door to Boccabella as the 3rd installment of the monthly American Roots Concert Series. Fabulous music in an intimate setting with wonderful food and drink from Boccabella next door. Boccabella will have full bar service and lighter fare available at the concert. Better yet, book a reservation for dinner at Boccabelle before the show. There’s only one acceptable excuse for missing this great show. The one I have. You’ll be across town in Waban at the Newton Nomadic Theater’s Colder Than Here. So Saturday get off the couch and go see a great locally produced show – music or theater around the corner that will dazzle you. Thanks Jerry, and in classic one-hand-washes-the-other fashion, I’ll remind everyone that in addition to the “Colder Than Here” performances at the Waban Library this weekend, theater fans can see it on April 19th and 20th at Gregorian Rugs in Newton Lower Falls, an intimate setting in a living room (mine) on April 26th and 27th, and at the fan-favorite closing venue of Dunn Gaherins Pub & Restaurant in Newton Upper Falls on April 28th. My favorite response to the Guy and Billy email I recently sent out was from a friend who said the first time she saw them was 30 years ago…when they performed at her wedding! Sharon and John’s marriage is still going strong so if you’re trying to add magic to your new relationship come to the show….just sayin’….